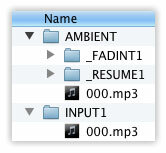 Ambient Resume - This option tells the BooTunes Amped to resume the ambient sound at the point it was interrupted, rather than starting a new sound from the beginning. 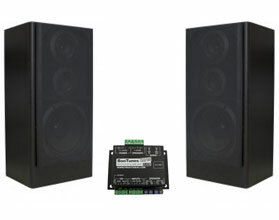 The # value specifies the fade rate in seconds to fade back into the sound. Fade on Interrupt - Cause the currently playing sound to fade out over # seconds, rather than end abruptly, if interrupted. Trigger Pre-Delay - Delay # seconds before playing sounds from a particular input. Trigger Post-Delay - Once a sound completes, ignore its trigger input for # seconds to prevent additional sounds in the same folder from playing too quickly. Next and Previous Track - Turns the input into a next or previous track control. Interruptible Inputs - Sets the input to allow interrupts from other inputs or it's own input. Slave Mode - This option will set the BooTunes Amped to act as a DMX slave to another BooTunes or BooBox. DMX Slave - This option sets the BooTunes Amped to a generic DMX mode, and sets the DMX channel to ###. 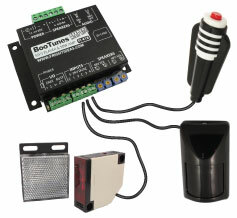 The BooTunes Amped enclosure has sturdy mounting flanges for easy mounting to control boards or cabinets. 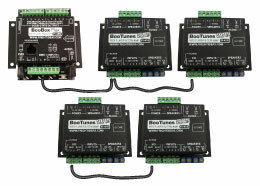 If you're also mounting other controllers, or would like to mount the BooTunes Amped to DIN rail, the BooTunes Amped snaps into standard 2.75" SnapTrack to easily mount devices side by side. Add some DIN Rail Clips if you'd like to mount the SnapTrack to standard 35mm DIN rail. Read the fright ideas blog post on mounting options for more information. 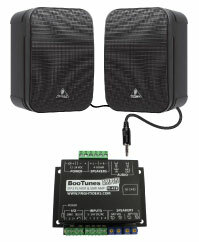 As with most of our other products, the BooTunes Amped is completely firmware upgradeable. Stay up to date with the latest features simply by downloading the latest firmware free from the Fright Ideas website.